In June this year, we are embarking on the trip of a lifetime! We’re one of 80 teams participating in the 2019 Baltic Rally, hosted by the Superlative Adventure Club. 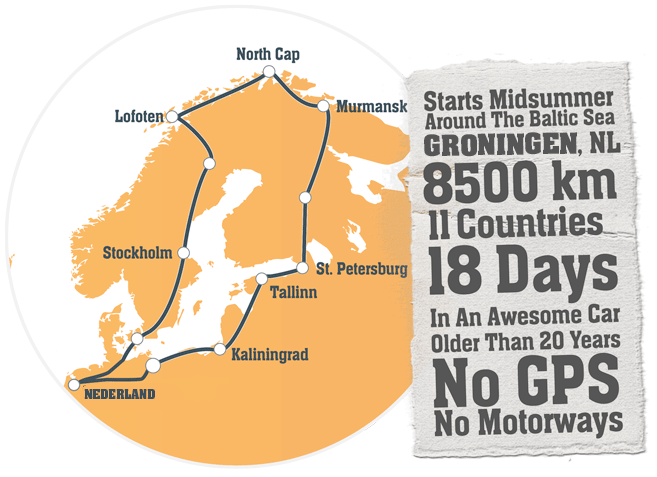 We’re hitting the road on an epic 8500-kilometre journey from Amsterdam, through the Baltic states to St Petersburg in Russia, up to the Nord Kaap (North Cape) in Norway and back to Amsterdam through Sweden – all of this with no GPS, no Google maps and a whole lot of getting lost. The journey will see us travel through 11 countries over 2 weeks in our borrowed 1996 Volvo V40. The plan is to spend as much time as possible camping, exploring and fishing in the European wilderness along with enjoying the numerous cities we will travel through including Berlin, Riga, Tallinn, St Petersburg & Oslo. We are using this opportunity to run our adventure as a fundraiser for The Amartya Foundation. The proceeds collected will allow us to expand on our sponsorship base, adding more members to the night school programme and supporting more vulnerable children in the local Siansowa community, read more about this here. Please feel free to purchase a T-Shirt or Necklace as a contribution as well from the shop. For businesses wanting to assist please get in touch with us. We appreciate your assistance and would like to take this opportunity to share your brand with the various other rally members. We’ll be having branded shirts and sticker kits made for the vehicle and team. Have a look below at how your input helps the less fortunate access the basic right to education and how that can have an impact on local communities as a whole.